Presenting a New Level of Scanning Performance, Durability and Precision with CipherLab's 2500 Series - CipherLab Co., Ltd.
Taipei, Taiwan - March 29, 2017- CipherLab, a leading innovator in Automatic Identification and Data Capture (AIDC), passionately presents the 2500 series handheld scanner as a means to extend efficiency in applications such as receiving, point of sale, shipping, inventory checking and work in process . Built with superior scanning capabilities, the 2500 series handheld scanner also provides business-rugged durable designs. User productivity will simultaneously speed up with 2500 series' ability to easily connect to a computer interface. 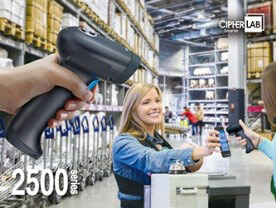 CipherLab's 2500 series' high-speed 578 scan rate and talent to read tiny barcodes instantly improves scanning accuracy and prevent misread possibilities. The 2500 series also features a thin scan beam that works well when barcodes are placed close to each other. When it comes to barcodes that are printed poorly or printed on reflective surfaces, the 2500 series has the scanning ability to easily read low contrast images. Businesses will possess the capability to capture data with ease and the most up-to-date advantages. The 2500 series handheld scanner is built for fast and simple deployments. When it is connected via USB, RS232 or keyboard wedge, the 2500 series has the ability to automatically detect the cables and access information in a flash. These advantages are totally protected with IP54 rating while being able to sustain a 1.8m drop resistance. On top of its ruggedness, the 2500 series delivers flexibility with built-in Bluetooth that maintains stable connection over a maximum line of sight distance of 100 meter. It's time to update your business efficiency with the up-to-date 2500 series scanner. For more details and specifications regarding CipherLab 2500 series or other CipherLab products, please visit www.cipherlab.com.